Searching for Polly: The ultimate guide to finding your lost pup. A dog parent’s worst nightmare is the thought of their furry child getting lost or stolen. This nightmare came true for Polly’s parents when they out of town with Polly one weekend. Luckily, Polly was found safe and sound! Allie, Polly’s mom, learned so much about lost dogs and how to find them during the experience. With all this learning Allie wants to spread the word to make sure that if this happens to you - you know what to do! Take a read below & make sure to check out @thelifeof.polly on instagram!! These are incredible tips and I feel so grateful that Allie has shared this guide with all of us!! Happy reading & hug your furry baby close tonight! I decided to make this guide after losing my 5-month-old petite Goldendoodle puppy named Polly in a remote area I had never been to before. Trying to spend time fielding all the social media messages, advice, and internet articles while still looking for her, trying to gather the correct supplies and technology, make posters, leave scent trails, etc. made it really hard to figure out the best way to spend our time in each second. I am not a professional and this is just my opinion. But if someone is struggling I believe the information included here can provide most information needed in a consolidated place, so you can get back out there and spend more time looking and spend less time researching and gathering info. DO NOT START SCREAMING FOR YOUR PET, calling loudly, frantically, shouting, or saying anything in a distressed or fearful voice. Even if you think you are masking your fear, dogs can often still pick up on this. If they hear distress in your voice or loud voices, they assume the situation is not safe. Then they may not come to you. Try using clapping and whistling. The crinkle of a treat bag. Your running car. Use calm, friendly, happy, conversational voices. Use words like their name, treat, or come. Don’t drag out your words in a calling tone. Try calling someone and talking on the phone while walking around. Them hearing your casual conversational voice could lead them to come out if they can hear you. If you are an owner, do try to talk in a conversational voice, so if your dog hears someone coming they have a chance to recognize your voice. Look for them, look for them, keep looking! Most pets are found within 5 miles of where they were lost. Get as many people as you can to help look. The more people you have looking, the better your chances are. You don’t even need them to catch them, all you need is a sighting. The people that find their dogs the fastest are the people that do not stop looking from the moment they go missing. Post online! (Details on how and where below.) Many towns have active Facebook groups specifically for your neighborhoods, lost and found pets, etc. Social media should absolutely be utilized. It is much easier to find a pet when an entire community is keeping an eye out for your furry loved one! Flyers and Posters are the #1 way that pets get home, so be sure to get posters up and hand out flyers to your neighbors. (Details on how below). Leave out Scents for them. Smells are the # 1-way dogs can find their way back to you. Cook up hot, smelly, and/or greasy food and put it outside. Rotisserie chicken, pizza, sausage, etc. The heat makes the scent travel further. Try breaking up the food in pieces to emit more scent. Put their dog treats or dog food in a bowl with water, heat it up and place that outside. If you can obtain a grill, even one of those mini portable grills from a convenience store that already has the briquettes in it. Get that and cook up some chicken or meat. This will keep the heated scents going longer. Place out articles of clothing of the owner(s). Underwear or things like jackets that you have worn a lot. Pillowcases or blankets you’ve been using. Place out items that smell like the dog - dog bet, blanket, harness, collar, etc. I have even heard to bottle owner’s urine and sprinkle out in the front yard. If the dog has been peeing and pooping where they were lost, that’s good too because they will pick up on the scent. Microchip your pets. Microchips do not have GPS but they have information, so if someone brings them to an animal facility, they will be able to identify you as the owners and will have your contact information. We use Save This Life. Save This Life also helps by creating a poster if you lose your pet. Always wear a collar with name tag and phone numbers on it. If you are in an area that you think they may get spooked, be extra careful. Have them leashed. Do not leave doors open. Buy a GPS tracker for your dog that attaches to their collar. Whistle Labs is one company that makes these. If you are not familiar with the area, find a local(s) that can help you with the geography, correctly canvas the area, and even will know a lot of locals that can help go door to door letting neighbors know to be on the lookout. When I lost my puppy in an area I didn’t know at all, I had almost a sort of liaison for the city. She helped me understand the geography and terrain, which roads connected to which forests, who lived at which houses, who else could help us, best places to look, etc. This was an invaluable resource for us. If you or someone else finds your dog, do not shout or chase after it. Sit or get low to the ground and stay still and calm. Have some treats on you. Try tossing the treats out at the dog to lure him/her towards you. Slowly inch towards the dog as you are doing this until you can grab them. If they run away, do not chase them as this will cause them to run further and make your search harder. Make sure you tell others helping this information. Try to have one of the owners home in the early morning. This is often a time dogs feel safer because there is less going on, and they will try to find their way back to you. Always be carrying treats with you, in case you see them so you can lure them to you with treats! Leave lights on, and the door cracked open if safe so they can get back in if they find their way again. Even if there are coyotes in the area, don’t worry or lose hope! Coyotes actually very rarely bother lost dogs. It is technically possible but much less common than perceived. Even if it is snowing or below freezing, don’t lose hope! Dogs are actually very hearty and able to survive below freezing temps. Try and look for dog paw prints in the dirt when you are searching. Write “MISSING DOG” with phone number on all you vehicles. As you are driving around people may notice, and some people have found their dogs this way. Try using a dog whistle. They may be lost in the woods and could be able to follow the sound. VERY IMPORTANT that you post this directly from your own FB account and make it PUBLIC. This way, if people see your post on a private group they can still go to your profile and share it. The Facebook group for the town that your dog is lost in. Ex. “Harpers Ferry, IA” This one is the most important to post on! Facebook group for lost dogs in your state. Ex. “Lost Dogs Iowa”, “Iowa - Lost Dogs, Cats & Pets”, “Lost/Missing Dogs of Iowa”, “Cedar Rapids, IA - Lost Dogs, Cats & Pets”. Use the search function to find more. Facebook groups for the kind of breed you have. Ex. “Goldendoodles Rock!”, “iheartgoldendoodles”. If you have Instagram, copy and paste your Facebook post and put in on Instagram as well. Large clear plastic bags to cover the whole sign - Hardware Store or you can cover with clear packing tape or clear contact paper. The tape and contact paper hold up longer but is more costly than the bags. Flyer Template - Get about 100 made and distribute to the area residents, stores, animal shelters, etc. Be careful about walking on to people’s property without asking first. Most people are incredibly kind and want to help but some can be dangerous so be careful. If you are in an area with bears, be careful about leaving out food. If it is hunting season and you are out in the woods, be careful. Buy orange hunting clothing. Dogs will do one of three: fight, flight, or freeze. If your dog is extremely small, it MAY freeze. This would mean hiding or burrowing. However, VAST MAJORITY of lost or scared dogs will flight. This means they will be moving on the run. Unless your dog thinks it could beat a coyote or wolf in a fight, it’s not going to fight. This being said, do not assume your dog is nearby cowering and hiding. Yes it is possible, but it is likely they have been running. They likely have traveled 1-2 miles. As time passes, this number could increase. When dogs are afraid they run run run until they are less scared, then they slow down and explore, until they pick up a familiar scent…then start back tracking. If safe, leave house door open while you go searching. Sometimes dogs won’t come out for one owner but will for another. Leave the car door open anytime you get out to look while searching. Dogs have made a run for it and jump in while the owner was out hanging flyers. Don’t expect your dog to act normally in this situation. It may be very scared and acting based on instinct. This could mean they will not come even if you call them, because they are too scared and considering everyone and everything a predator. 7/10 found dogs are found because they make their way back to you. 3/10 are found because someone searching spots them and is able to pick them up. Dogs go by scent more than anything else. Many dogs will come back and try to find you early morning when things are calm and quiet outside. If at all possible, have the owner bring a chair and sit outside in the place the dog was lost from. They will be most likely to come up to you. Your scent will help them find you. Keep hot and smelly or greasy food out with you. Dog treats. Their dog blanket. Your underwear. Anything that smells like them and you will help them by providing a scent. Is your dog typically friendly or skittish and scared around humans? If friendly, they may “turn themselves in” to a human eventually. If skittish, they may be too scared to. Does your dog like other dogs? If you have access to another dog bring them out to search with you. Their scent, especially if they pee and poop, could help lead your dog to you. They will rarely make noise because they are scared of predators. If any noise, it would be crying. These people can bring dogs that can track the scent of lost dogs. They can be very expensive especially if they have to travel. Make sure you have correct expectations; there is no guarantee they will definitely find your pet. In fact in my case, even though I was willing to pay, I was basically told the chance was so slim they felt it would not be ethical to accept the money and take the job at all. The longer your pet is gone the harder it will be for the tracking dog to find the missing dog. Don’t lose hope! Dogs can survive weeks and even months on their own, even in the cold. I know a lot of information can be conflicting, even in this info packet. I want to leave you with the thought that YOU know your dog. The truth is, they could do any number of things. The whole time I thought my puppy was hiding somewhere near, she had actually been on the move and traveling a very far distance. 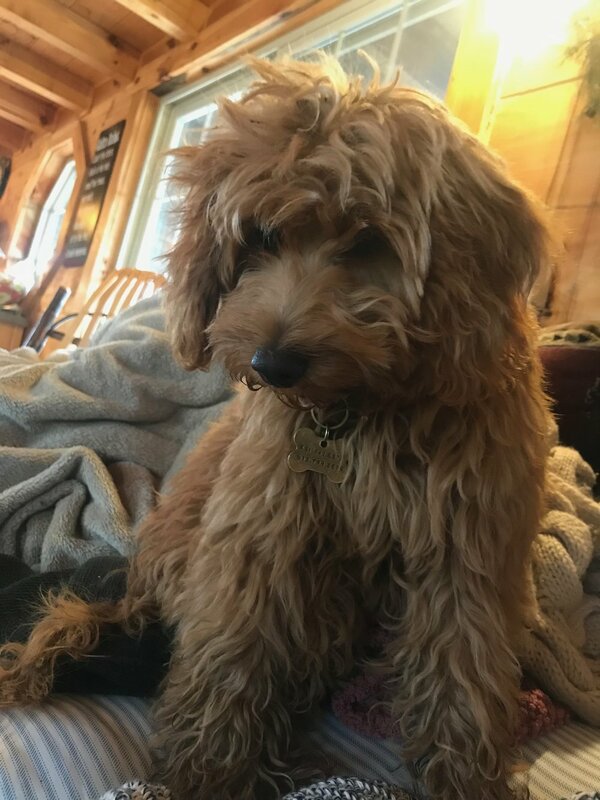 I was thinking more about her tendency to be fearful, but thinking back, she is a Goldendoodle who loves to run so I should have thought about that possibility sooner. As long as you are trying, what ever you are doing is NOT WRONG! Think about your dogs personality and maybe what they would do in this specific situation. I know you cannot predict it but there is no one answer, so go with your gut. Or better yet, try multiple different tactics. Keep switching it up. Remember to give them clues so they can try to make their way back to you. And don’t give up until you find them! It is truly a miracle that we were reunited with Polly. Here is a picture of her right after she got back to us. Some friends and I were staying out in Harpers Ferry, IA for a fun cabin weekend. On Sunday morning she got spooked while the front door was open and took off sprinting. I went screaming yelling after her as fast as I could but she was gone just like that. What was a fun relaxing weekend with friends quickly turned into a nightmare in a remote unfamiliar area in the country. No lights, vast, heavily wooded areas with extremely steep cliff-like angles, slippery mud leading down to creeks. Huge fields with tall thick brush, huge thorny branches and burrs everywhere. Coyotes and the possibility of eagles or wolves. Our hope was that Polly make it out of the forest without getting stuck or eaten and would get back up to a house, but many of those were empty as many are weekend homes. This was in freezing cold rain and heavy winds in the low 40s. We didn’t even have boots or coats for the first maybe 7 hours. We just kept walking through forests fields or around houses looking. It was also hunting season there. One of the most terrifying parts was when a man actually lock and loaded a gun and pointed it at me for being on his property even though he knew I was just looking for my lost puppy. We took turns sitting out on the porch all night in case she showed up. We each slept maybe 1-2 hrs total. I have never been more scared than I was this weekend in my whole life. However, the most fantastic part of this story is the people. Every time I was about to lose hope and break down, someone was always there to hold me up. Strangers and family alike. There is no way we ever could have done this alone. Our family and friends, all the non-profit organizations and volunteers, professional pet rescuers and the social media communities were all amazing in helping us. HEART (Helping Every Animal Rescue Team), Humane Society of Northeast Iowa, The Retrievers. But the most amazing was the people of Harpers Ferry and the surrounding areas. The entire community dropped what they were doing to help search for her and gather any resources possible. I was astounded at the non-wavering hope in finding this tiny dog and their relentless efforts to find her. Debbie Mink, thank you for being my guardian angel throughout this entire situation. We could not have done it without you. I am tearing up again writing this. So many tears throughout this weekend. But the best was Polly’s tears of happiness when she was finally reunited with us. A kind man found her out in his yard 3 miles from our cabin. As soon as he came outside, she walked right up to him. She wanted to be found by humans and was essentially turning herself in. He brought her right in with dog food after 26 hours out in the wilderness, read her dog tag, called us, and we came and picked her right up. It’s estimated she traveled 10-11 miles based on a sighting the previous morning. I’m so proud of Polly for getting out of the forest and finding a home with people there. It was truly a miracle she was brought back to us, and I am so happy our family is reunited again. Thank you again so much to everyone for your love, support, advice, help, & prayers. And GO POLLY for making her way back to us! !